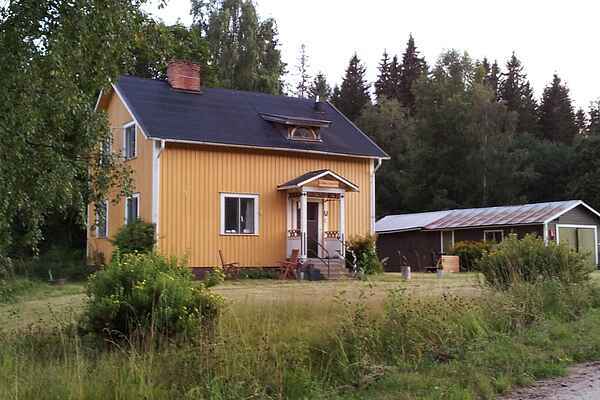 Beautiful detached holiday home with typical Swedish character. The home has a perfect location in the village of Munkfors. Munkfors has a charming town centre and its own waterfall, which is certainly worth a visit. You can take lovely walks in the area. Near the house there are elk, deer, pigs or cranes for your viewing pleasure. This region even has more elk than people. In Karlstad you can shop and in Filipstad you can take winter Husky dogsled trips. This town is known for its wonderful natural beauty. The second largest lake in Europe "Vänern" is also in this region. The skiing is great in Sunne and Torsby. In short, a wonderful Swedish holiday home to really relax in. In the heart of Värmland you will find "Villa Sandrien" at the end of the peacefull community of Munkfors. From the woodenbridge behind the house you can take a hike in one of many forests. There is enough space to make campfires, hike, ride a horse, or rent a sauna at a lakeshore. (Just ask at the Tourist information in the villagecenter) The City of Karlstad is only 60 km away. The small villages of Sunne and Hagfors only 30.